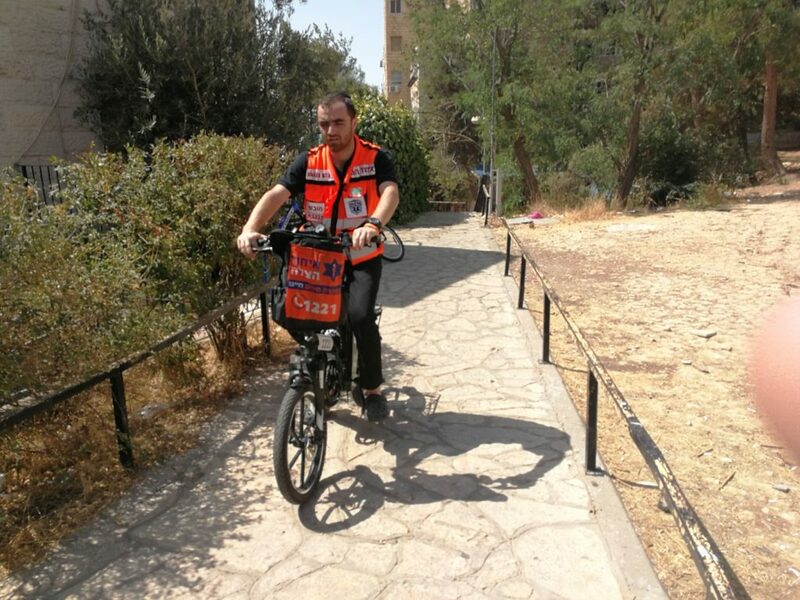 Yechiel Gurfein continues his amazing work as a United Hatzalah volunteer, saving lives with his emergency electric bicycle. Sometimes, Yechiel saves lives in unexpected ways. Recently, Yechiel was staying at a friend’s home in the central Nachlaot neighborhood of Jerusalem. At 5:15 a.m. he awoke to the shrill sound of a terrified neighbor screaming. Yechiel jumped out of bed and called 1221 (the United Hatzalah hotline) for back-up and raced upstairs to the home of a neighbor where he heard the screaming coming from. It was a woman’s home. Thick smoke was filling the hallways. The neighbor stood in her apartment frozen in panic, as huge flames leaped up from her electrical outlet. Yechiel roused sleeping family members (9 residents total, including 4 vulnerable children) and helped them make their escape. The United Hatzalah medic then caught an aspiring good samaritan just as they were about to splash a bucket of water on the circuit breaker, potentially making matters far worse. Using household items such as towels, Yechiel and the other man managed to safely snuff out the fire. Frightened family members (wearing only pajamas) had escaped the smoke and flames thanks to Yechiel but were now shivering in the freezing pre-dawn temperatures. The United Hatzalah EMT quickly grabbed blankets to warm them, reassuring both children and grown-ups alike as he assessed them for smoke inhalation. By the time the firefighters arrived, all that remained was to double-check the apartment and ensure scene safety. This entry was posted in Uncategorized and tagged EMS, EMT, Fire, Jerusalem, Rescue, United Hatzalah, Volunteer. Bookmark the permalink.